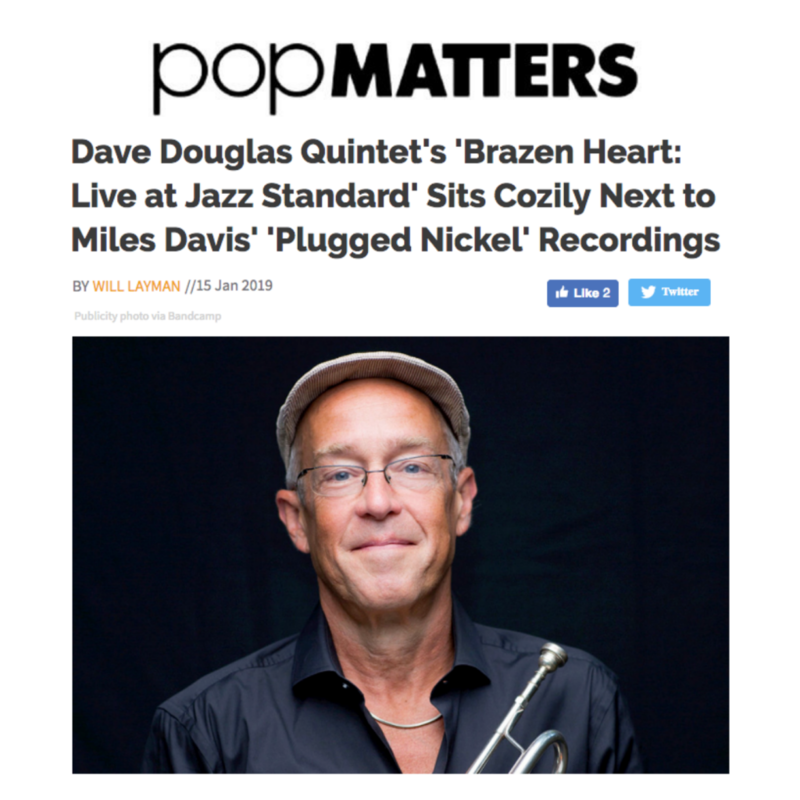 Will Layman of PopMatters has written an in-depth review of the Brazen Heart Live at Jazz Standard, the 8-CD set by the Dave Douglas Quintet that was released in late 2018. Listening to over eight hours of the band’s music is a joy and a cinch, demonstrating that this classic jazz instrumentation can tackle many forms and create many pleasures. When this band is hitting on all cylinders, with the two horn interwoven, Mitchell’s piano leaping and strumming and inventing, Oh down below and Royston kicking and stoking from all sides, it seems like it might be twice its size, a small orchestra or conversation, reverberation, and cross-currents. That Douglas constructed such an ingenious book for the band adds to its sense of breadth: in this music, we find groove, swing, plainsong, worship, ambivalence, clarity, joy, and heartbreak. You need a small orchestra to say all of that. And, somehow, this quintet was a small orchestra, with Douglas’s compositions and arrangements matched to its strengths and range, its expressive possibilities. Brazen Heart, Live at Jazz Standard is a symphony for what a jazz group can be when it is truly powerful and alive. It is a masterpiece of the form, the long form. And it will sit next to Miles Davis’s Plugged Nickel recordings for decades to come. The complete box set and the individual nights (Thursday, Friday, Saturday and Sunday) are available from our Bandcamp store.